An inordinately moving, electric exploration of two warring cultures fused in love, focused on the lives of four Chinese women—who emigrated, in their youth, at various times, to San Francisco—and their very American 30-ish daughters. Tan probes the tension of love and often angry bewilderment as the older women watch their daughters "as from another shore," and the daughters struggle to free themselves from maddening threads of arcane obligation. More than the gap between generations, more than the dwindling of old ways, the Chinese mothers most fear that their own hopes and truths--the secret gardens of the spirit that they have cultivated in the very worst of times--will not take root. A Chinese mother's responsibility here is to "give [my daughter] my spirit." 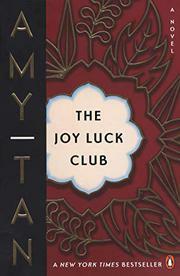 The Joy Luck Club, begun in 1939 San Francisco, was a re-creation of the Club founded by Suyuan Woo in a beleaguered Chinese city. There, in the stench of starvation and death, four women told their "good stories," tried their luck with mah-jongg, laughed, and "feasted" on scraps. Should we, thought Suyuan, "wait for death or choose our own happiness?" Now, the Chinese women in America tell their stories (but not to their daughters or to one another): in China, an unwilling bride uses her wits, learns that she is "strong. . .like the wind"; another witnesses the suicide of her mother; and there are tales of terror, humiliation and despair. One recognizes fate but survives. But what of the American daughters--in turn grieved, furious, exasperated, amused ("You can't ever tell a Chinese mother to shut up")? The daughters, in their confessional chapters, have attempted childhood rebellions--like the young chess champion; ever on maternal display, who learned that wiles of the chessboard did not apply when opposing Mother, who had warned her: "Strongest wind cannot be seen." Other daughters--in adulthood, in crises, and drifting or upscale life-styles--tilt with mothers, one of whom wonders: "How can she be her own person? When did I give her up?" With lantern-lit tales of old China, a rich humanity, and an acute ear for bicultural tuning, a splendid first novel—one that matches the vigor and sensitivity of Maxine Hong Kingston (The Warrior Woman, 1976; China Men, 1980) in her tributes to the abundant heritage of Chinese-Americans.